As I write this, I’m sitting with my shamrock socks on (that I may or may not have stolen from my mom) and a shamrock scarf my grandma sent in the mail. Later today I’ll take a picture of my attire (along with eating this Irish soda bread) and send it to my grandpa. ‘Cause that’s how we celebrate. 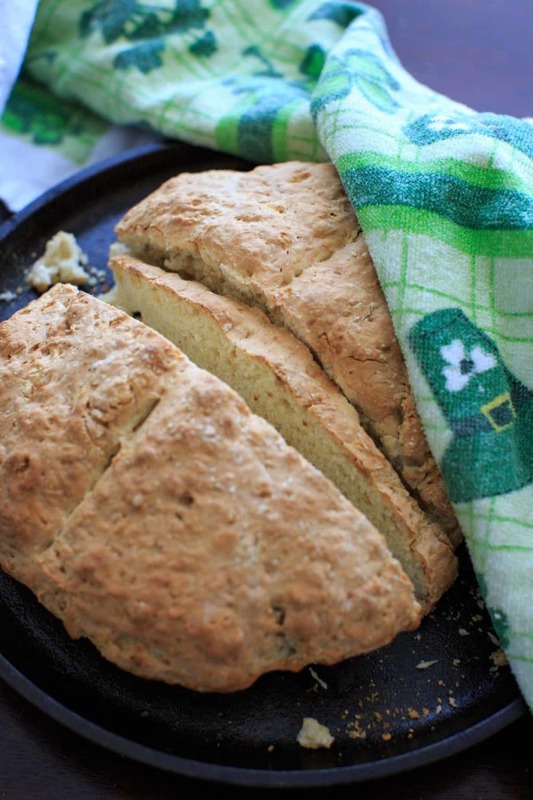 This is the first “Irish food” recipe I’ve done, but not for lack of thought. Irish food includes a lot of meat and potatoes. And alcohol. Bailey’s cream would have been a good bet. But I’m never against baking a good loaf of bread. So I did as instructed and only used those four ingredients, made an X in the dough (this is to help the inside cook more evenly) and popped it in the oven. Then I realized why people usually add more stuff in. It’s still BREAD don’t get me wrong, but it’s a very dense and simple bread. This is why a lot of quick breads are usually sweetened with fruits or things, since they’re missing out on the flavor from yeast and eggs. Obviously a good thing for getting through Famine years, but not as difficult to understand why Americans have complicated it a bit. 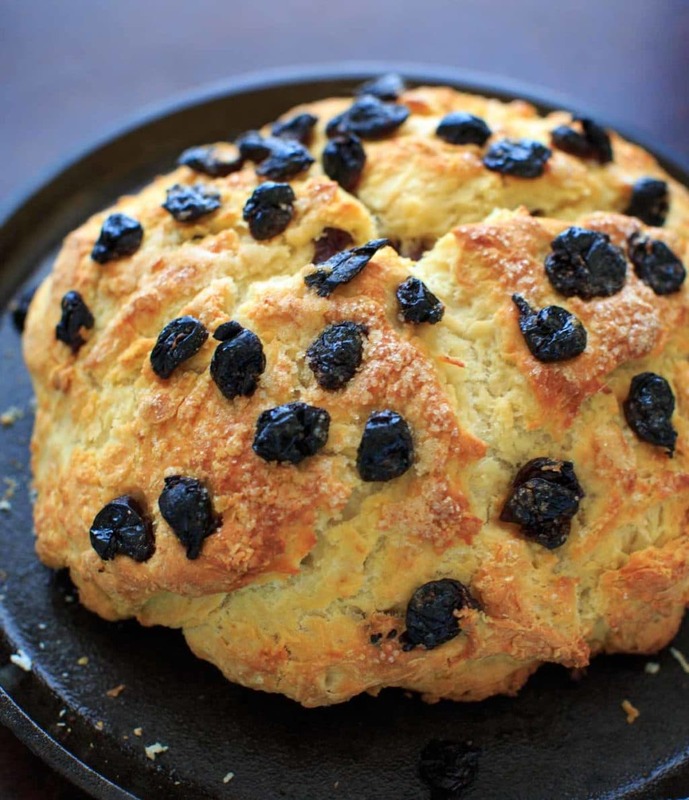 So while this is still the TRADITIONAL Irish soda bread recipe, I’m still going to give you some options for add-ins. I’ve made both versions and will eat both versions. Especially with a little Irish butter and/or Irish cheddar cheese. I will not be going hungry this weekend. Sweet options are pretty popular with dried fruit and/or caraway seeds. Caraway seeds are apparently what’s used on rye bread. Raisins are a common choice, and I tried a version with dried cherries (below). Just a word of advice – whatever mix-ins you use (1/2 cup to 1 cup worth), add it to the flour before your buttermilk or else it probably won’t mix properly. I had to press all the cherries in to the top of the bread and even then they didn’t stick. For this version I also added a little melted butter to the top and a couple tablespoons of sugar to sweeten. Pretty, but probably not what Irish table spreads looked like back in the day. Whichever way you try, let me know what you think! It’s become common to bake the bread on a cast-iron skillet, but I also baked one in a dutch oven and you could just plop it on a baking sheet. Either way you’ll be well-fed! Another recipe for St. Patrick’s Day: Irish Pub-Style POTATO Nachos! 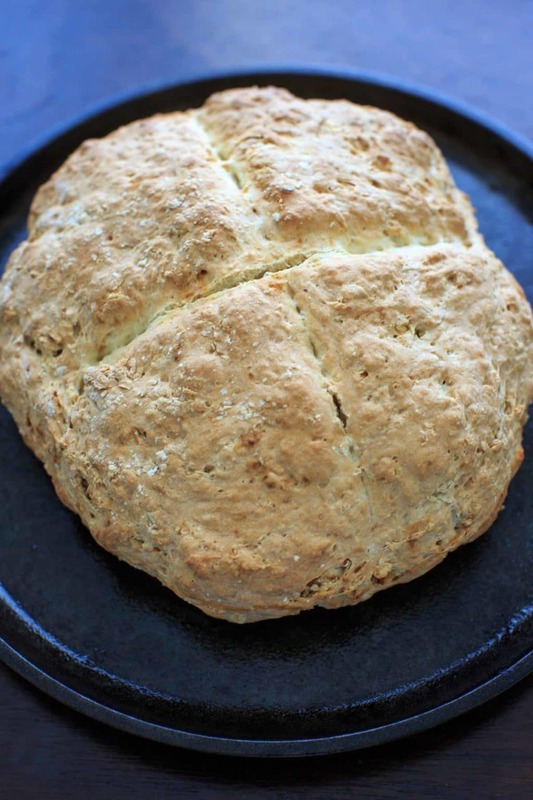 Traditional Irish Soda Bread recipe. Includes options for sweet and savory add-ins to make it a little more "non-traditional." In a mixing bowl, add flour, baking soda and salt. Whisk together. Make a well in the center of the flour and pour in buttermilk. Mix together (using hands is the best way to do this) until just combined. Do not overwork or knead the dough. Texture should be slightly crumbly but just sticking together. Form into a ball and place on a cast iron skillet, greased baking sheet or dutch oven. 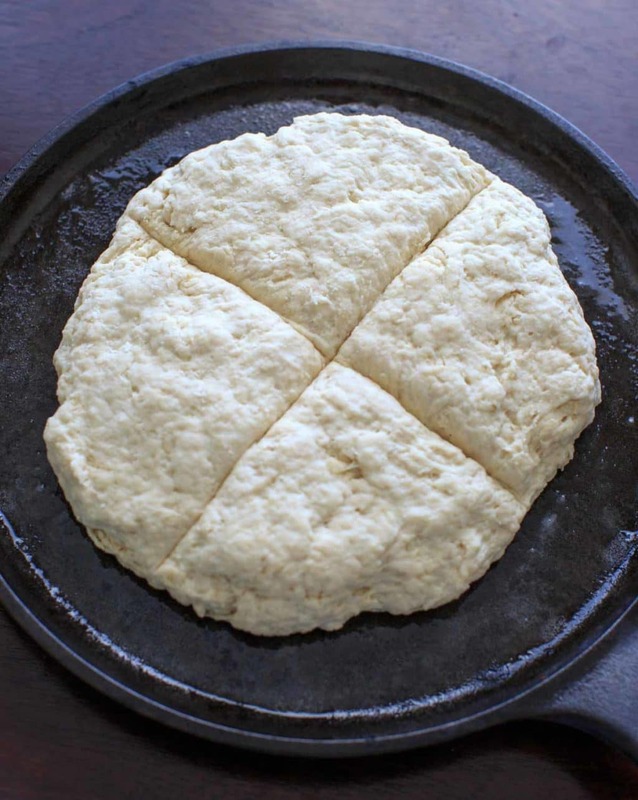 Make an "X" in the dough with a knife, about an inch deep. Bake for 40 minutes or until outside is browned. *A general rule of thumb is 1 lb. flour to 12 oz. buttermilk, with a spoon of baking soda and salt. If the dough is too crumbly, add more buttermilk (a tablespoon at a time) until it just sticks together. Same if dough is too wet, add more flour (a tablespoon at a time). 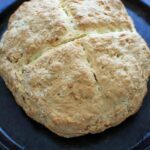 **See post write-up for ideas for mix-in's (sweet and savory options) for a "non-traditional" soda bread recipe. I did not try this recipe yet because I swear by my own. Start with the above ingredients. The basics are similar but I add 4 tsps. 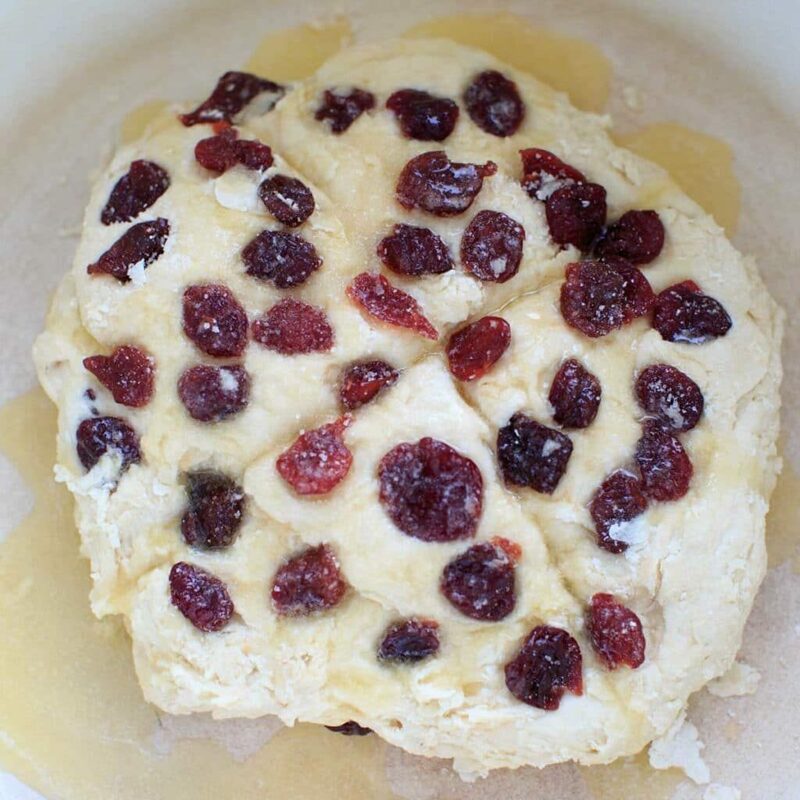 of baking powder, 1 cup of sugar, 1 cup of raisins (floured before adding), 1 tsp. caraway seeds, 1 stick of butter, 2 eggs and 1 c. of milk. It is best served with butter. I bake multiple loafs because they are devoured, especially today. Happy St. Patrick’s Day, Kelly. Thanks Pat – I’ll have to try your version too!